Unconditional love...that's what I think of when I see someone with their dog. 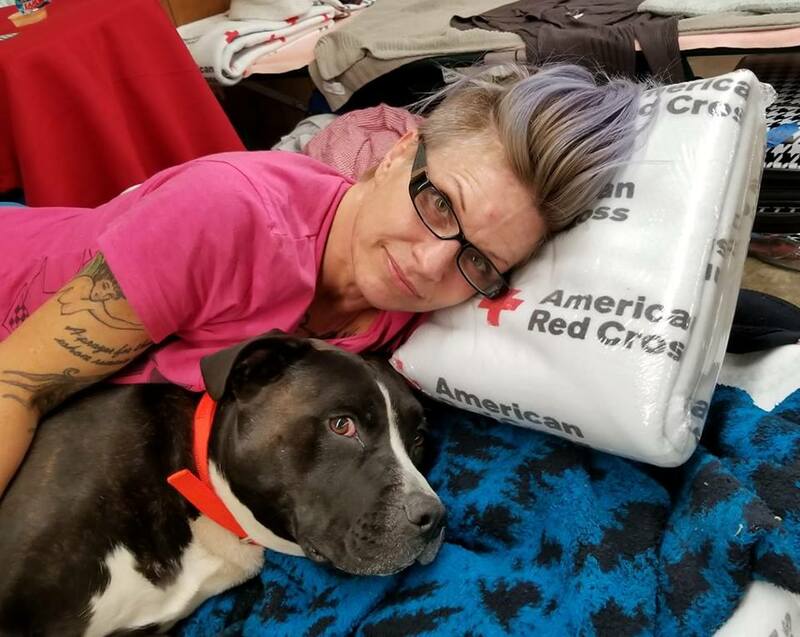 I met Brandi at the American Red Cross Silver Dollar Fairgrounds shelter a few days ago. Her hair color and vivacious personality caught my eye. I always like friendly people. She has been through so much yet she keeps moving forward. Boss (her dog) saved Brandi's life by alerting her to the fire! She had only minutes to escape because the neighbor's home was already on fire when he woke her up! Her grandmother's ring is the only thing she managed to grab on the way out. She hopped into a friends car which they soon had to abandon because the back tire popped from the intense heat! On foot briefly, another friend picked her up and they attempted again to get out of town. But they were gridlocked for a few tense minutes on what seemed like the only road out of town. Seeing the sheriff they got out of the car and asked him where should we go? Which direction? The sheriff replied....just run. Thankfully, the congestion eased and only by driving through a wall of fire on the road did they manage to escape with their lives. Brandi saw some unspeakable sights that do not bear repeating. Thankfully, we have some wonderful Disaster Mental Health volunteers that Brandi has been talking to with regularity. "The Red Cross has been so kind and accommodating especially with Boss. They didn't have to be." This is just one story of the way the American Red Cross has cared for the evacuees of Paradise.